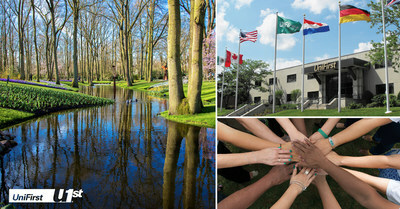 WILMINGTON, Mass., March 25, 2019 /PRNewswire/ -- UniFirst Corporation (NYSE: UNF), a North American leader in providing customized work uniform programs, corporate attire, and facility service products for business, has been included on Barron's second annual list of the 100 Most Sustainable Companies in the United States. To determine the rankings, Barron's partnered with Calvert Research and Management to analyze the 1,000 largest publicly held companies by market value with headquarters in the U.S. Each company was assessed against 300 performance indicators in five categories: shareholders, employees, customers, planet, and community. "We're honored to be recognized as one of the country's most sustainable companies," says Steven Sintros, president and CEO of UniFirst Corporation. "UniFirst is committed to creating long-term stakeholder value and we work hard to maintain focus on our ethical, social, environmental, cultural, and economic responsibilities as a company to help keep overall sustainability front-of-mind. And, while we've accomplished much in these areas over the past year, we continually strive to achieve more." The announcement comes at the same time UniFirst released its newly updated 2019 Corporate Social Responsibility (CSR) Report, which serves as a comprehensive review of the company's latest efforts surrounding CSR and sustainability for the benefit of all UniFirst stakeholders.